Top secret document reveals British troops were knowingly revealed to radiation during nuclear fallout tests – mirror.co.uk, by Susie Boniface, 2 Jan 2011, British troops WERE knowingly exposed to radiation during nuclear fallout tests, a top-secret document has finally proved. For five decades, successive governments have denied any harm was caused to the 22,000 servicemen ordered to witness nuclear bomb tests in the Fifties and Sixties – saying the explosions were to test the weapons, not their effects on humans, and the men were at a safe distance. It has the words “by men and animals” crossed out in pencil, and the version that was actually released mentions only sheep and small animals. The document blows apart official claims that the tests were not harmful to the troops who witnessed test blasts in Australia, the US and the South Pacific. It also backs the test veterans’ claims that they were used as “guinea pigs” by the MoD in its race to build an atomic bomb. Since the tests they say they have suffered high rates of cancers and other illnesses. More than 1,000 vets and widows have won the right to sue the MoD. The top-secret Press release was unearthed by veteran David Wilson, 74, from Shropshire, who served as an RAF clerk at Christmas Island in the South Pacific during two bomb blasts. The press release was drafted ahead of Operation Buffalo at Maralinga, during which troops were ordered to crawl through areas hit by fallout. It was not meant to be made public until..
Coal-seam gas advisers’ links to mining industry exposed BY: NATASHA BITA The Australian May 14, 2012 MOST of the scientists advising the federal government on coal-seam gas pollution have financial links with the mining industry. Who is telling the truth? New South Wales Minister for Resources, Mr Hartcher? or the Queensland government? In fact, both States prohibit uranium mining. New South Wales has recently allowed uranium exploration only. 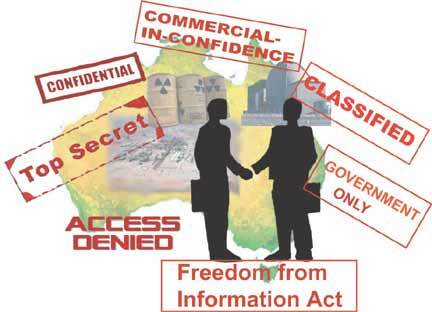 THE HINDU 4 May 2012, reports that New South Wales Minister for Resources and Energy and Central Coast Christopher Peter Hartcher announced on Friday that both New South Wales and Queensland State governments in Australia had changed their laws which prohibited mining and sale of uranium. Queensland Premier Newman has recently reiterated the position that uranium mining is banned in Queensland. And as for Mr Hartcher “respecting” India’s decision on the NPT, he is in the minority. Most Australians are appalled at the idea of selling uranium to a country that won’t sign the NPT. Protests against coalmining so far have been peaceful. Resources and Energy Department briefings show that only four protests have interfered briefly with electricity generation. ASIO eyes green groups, The Age, Philip Dorling, April 12, 2012 AUSTRALIA’S leading counter-terrorism agency has been providing intelligence to the federal government on environmental groups that campaign against coalmining. Lynas had denied reports that the Western Australian government had refused to accept the radioactive waste from the miner’s RM2.5 billion rare earth plant in Malaysia. “loose environmental laws” and “non-functioning administration”. has yet to receive any request from Lynas Corp to accept radioactive waste from the Australian miner’s controversial rare earth plant in Gebeng, Kuantan that will be ready this June. Reporter: Emma Alberici Climatologist and director of the Earth System Science Centre in Pennsylvania State University Michael Mann joins Lateline. Mr McLean revealed that Australia and other nations began compiling elaborate evacuation plans amid growing concern and uncertainly as the Fukushima plant began to explode. The former ambassador confirmed Australia had evacuation plans in place but voiced the uncomfortable truth that, in reality, greater Tokyo (population 35 million) would have been almost impossible to evacuate. Australian spies buying computer bugs: sources, SMH, Cynthia Karena, March 8, 2012 Cyber criminals are not the only ones buying software flaws, say sources. The Australian government is buying computer security weaknesses found by hackers before they are sold on the black market, as part of its defence strategy, claim those at the coal face of cyber security. “The Australian government has developed these capabilities as part of ASIO, DSD [Defence Signals Directorate], CSOC [Cyber Security Operations Centre] and possibly others. But they are purely for research and defence,” says an Australian security consultant who wishes to remain anonymous. A history of dishonesty – Waubra Foundation, Landscape Guardians, and the Baillieu government. The answer is that no government could have been so easily duped unless it was complicit. It is clear that the scuttling of the wind industry in Victoria was a deliberate political ploy to appease the coal industry, with the Guardians’ scare campaign simply serving as window dressing to dupe the public into thinking it was all in our interest. This is the third part of Independent Australia environment editor Sandi Keane’s trilogy on the role of deception in the public debate on global warming. The first part, Deception is our Product, looked at the role of clever PR practitioners hired by the mining oligarchs to trick the unsuspecting into sacrificing their interests for those of their clients. The second part was the handy guide: The Practical Guide to Trickery & Fakery in the Digital Age. This thirdinstalment is the actual case study of Sandi’s investigation of the Landscape Guardians and the Waubra Foundation. CASE STUDY: The Landscape Guardians and the Waubra Foundation, Independent Australia, 6 March 12, It began early last year, when a mate who likes to argue the toss with me on enviro-issues tipped me off about the anti-wind group, the Landscape Guardians. Olympic Dam mine is a dam designed to leak an average of three million litres of liquid radioactive waste a day from the tailings storage facility through decades of mining up to 2050. Our uranium fuelled Fukushima, David Noonan, The Guardian, 22 Feb 12, Australian uranium fuelled the Fukushima nuclear disaster yet our governments have just approved the world’s largest uranium project in BHP Billiton’s proposed new pen pit mine at Roxby Downs. “We can confirm that Australian obligated nuclear material was at the Fukushima Daiichi site and in each of the reactors – maybe five out of six, or it could have been all of them; almost all of them”. New South Wales Renewable Energy Guidelines aim to prevent small scale wind energy! not faced by any other kind of development. NSW wind farm guidelines shaft clean energy, Green Left, February 16, 2012 The draft planning guidelines for wind farms in NSW, which are now open for public comment, have been labelled inconsistent, too restrictive and politically motivated by environment group Friends of the Earth. “These guidelines talk about NSW planning to help Australia meet its the 20% by 2020 Renewable Energy Target, but at the same time could pose severe restrictions on the options available to achieve that,” said Ben Courtice, renewable energy campaigner for Friends of the Earth.